PBS Annual Meeting, Denver, Co., May 16, 2012 – PBS today announced that journalist Gwen Ifill is the recipient of the eighth annual PBS “Be More” Award, which celebrates individuals in public television who embody the spirit of helping Americans to discover more, to experience more and to “Be More.” The award was presented to Ms. Ifill by PBS President and CEO Paula Kerger at the PBS Annual Meeting in Denver. Ms. Ifill is moderator and managing editor of WASHINGTON WEEK, the longest-running primetime news and public affairs television program, and senior correspondent for PBS NEWSHOUR, one of the most trusted news programs in television. She is also a best-selling author and moderated the Vice Presidential debates during the Presidential elections in 2004 and 2008. This fall on PBS NEWSHOUR, Ms. Ifill will co-anchor live coverage of election specials, including the Democrat and Republican conventions, the presidential debates and the vice-presidential debate. 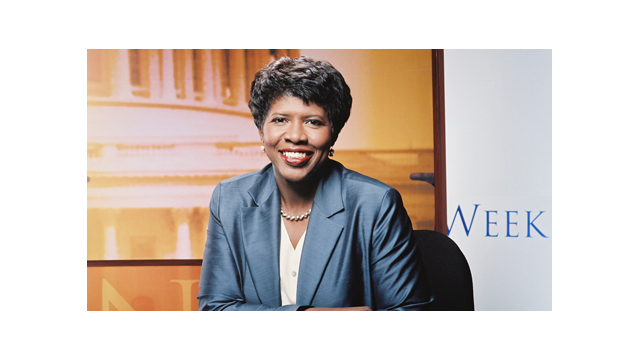 Before joining WASHINGTON WEEK and PBS NEWSHOUR in 1999, Ms. Ifill was chief congressional and political correspondent for NBC News, White House correspondent for The New York Times, and a local and national political reporter for The Washington Post. During her career, she has received more than a dozen honorary doctorates and is the recipient of several broadcasting excellence awards, including a George Foster Peabody Award and Harvard University John F. Kennedy School of Government’s Goldsmith Career Award for Excellence in Journalism. The PBS "Be More" Award is an annual award that recognizes extraordinary individuals who inspire public television viewers to expand their horizons, to experience growth and adventure, to explore new ideas and to be more. Based on PBS' award-winning “Be more” brand campaign, the award’s previous recipients are Ken Burns, Joan Ganz Cooney, Rebecca Eaton, Jim Lehrer, Bill Moyers, Fred Rogers and Neil deGrasse Tyson.